So this tiny rocket-shaped plastic item arrived in the mail a week or so later, with instructions written for a kid just like me. Simple enough alright but I quickly realized I had no water pipe in my bedroom, and the alligator clip cord wouldn’t reach all the way to the bathroom. Not to be deterred, I connected the supplied alligator clip to my bedroom window screen, snuggled under the covers, and listened. At first I heard only distant static, but then, growing ever stronger as if riding the crest of a wave, came music, both familiar and strange. I recognized Elvis, and then something from the Grand Ole Opry, and next a pitch for Brylcream and finally a man speaking Spanish … and just like that a young boy was hooked on the lure of the airwaves. I never knew what was coming next and that intrigue and uncertainty fueled my burgeoning youthful imagination. My Rocket-X was soon replaced by a Goliath of a receiver, a National NC-183D, and I heard even more seductive and wonderful signals through my headphones each night. Broadcasts in more languages than I knew existed came crackling in, along with curious beeps and tones that I later learned were Morse Code signals. I was determined to understand those as well, and thanks to my Dad’s intervention, was soon sitting in on a code class being given by the local radio club. As is the fortuitous case with most youngsters, the code came to me effortlessly, and I had a solid grasp of the alphabet, numbers, and radio Q signals in short order. 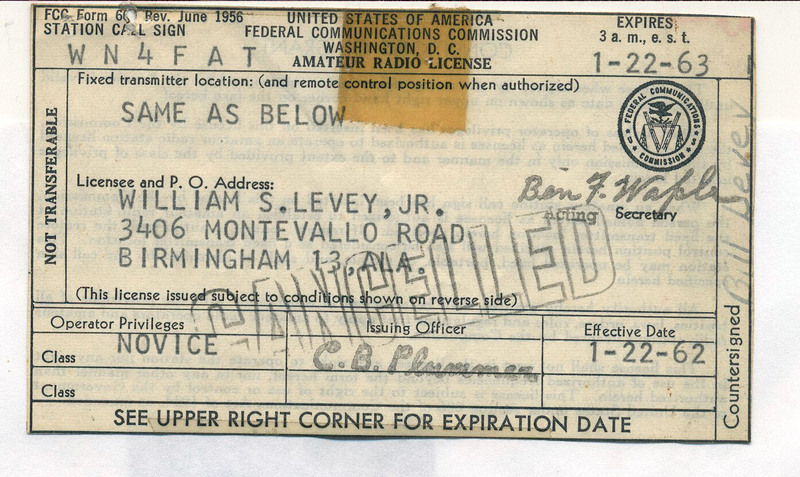 An Amateur Radio license exam was the next important order of business for this radio-obsessed pre-teen, and was administered by a family friend who was also our life insurance agent. Little did he known that he was insuring a lifetime of joy and wonder that far exceeded any standard policy he could ever have written. So eager was I in anticipation of that coveted envelope and license from the FCC that I stood by the dining room window and peered anxiously with binoculars down toward our mailbox each afternoon. I placed a colored piece of paper half in and half out of the box, so that it would fall to the ground when the mailbox had been opened and I’d know the mail had arrived. The first week’s wait didn’t go quite as expected though, as I would find mail in the box and the signaling paper still in place as well. Watching the mailman one day, I discovered he was carefully replacing my tell-tale colored strip of paper, assuming it had some higher calling. I rushed to explain my urgency and the signaling device I had employed, and once he was on to my scheme he allowed the paper strip to fall to the ground each day. And my license finally arrived … and I was crushed by what I found inside. You see I was always particularly sensitive of my slender build, so much so in fact that I rarely wore shorts back then, fearful of exposing my often mocked legs. And what could be more humiliating than a mocking callsign? 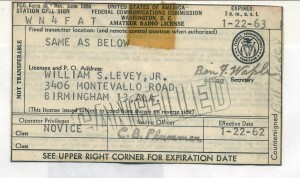 My Novice Class Amateur Radio callsign was WN4FAT! FAT? Not me. Not in a million years, I thought. But then I sounded out that new callsign in Morse, and it had quite the nice rhythm, I thought – di di dah dit di dah dah, and my initial embarrassment quickly faded to hopeful optimism. And so started a lifelong love of Morse and Amateur Radio. Next PostCould this be a first in Amateur Radio? Really enjoying your posts – all magical stories indeed! Bill, Tnx for the contact, next day I checked I had enough to get Tribune status in SKCC; also thanks for the QSL cards. 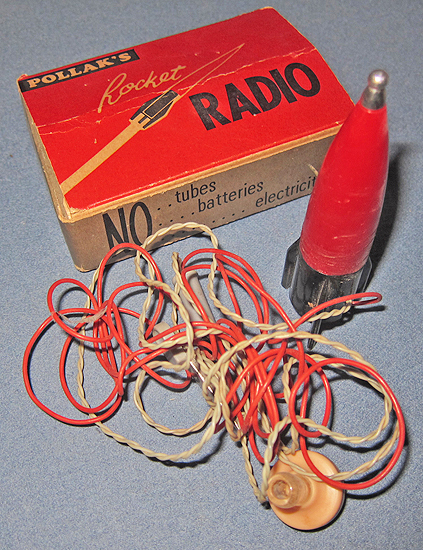 I have enjoyed reading all post; I also had the same crystal rocket radio en I was 11 yrs old….good memories. Hope to cu soon on the air. Sigue haciendo un buen trabajo, te felicito.